A project is a logical container that contains group of articles arranged under relevant categories and sub-categories and with relevant settings for your software product. 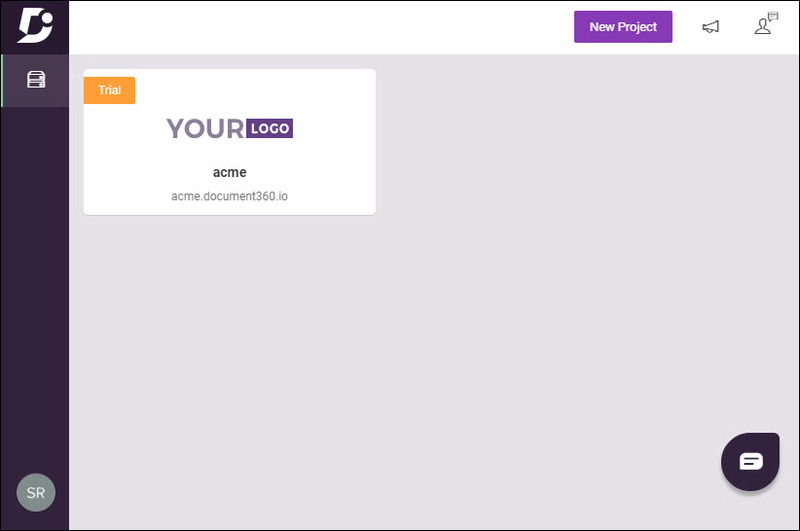 You can create a project for a software, say ACME, as acme.document360.io. Within the project, you can organize your articles into multiple categories and sub-categories. If you are a partner or a consulting company, you can create individual projects for each of your customers and maintain the documentation with ease. 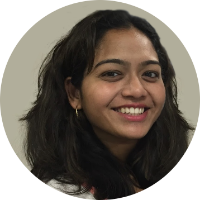 You first need to create a project in Document360 in order to be able to write your documentation. If you are logging in for the first time into Document360, you will be prompted to create a new project. You need to provide the project name, sub-domain name, and upload a logo image/add logo text. 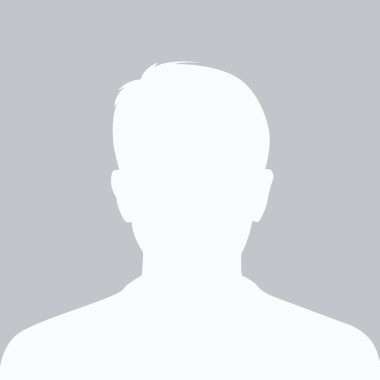 The sub-domain name will be automatically populated with the name entered in the project name field. You can choose to retain the same name or change the value. 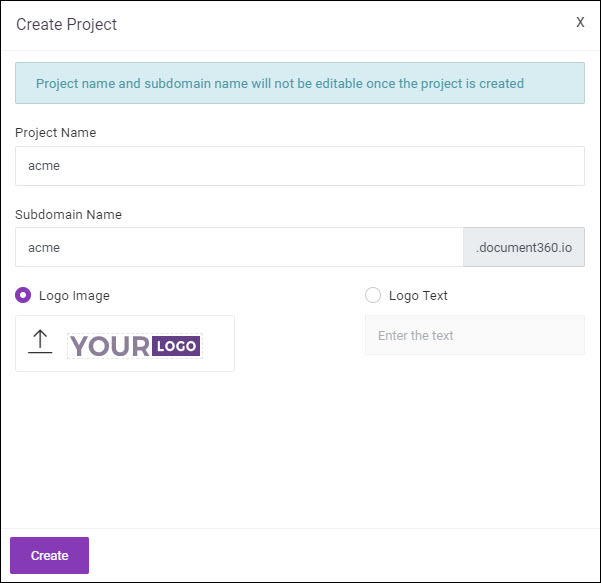 You cannot edit the project name and sub-domain name once you have created the project. If you are in the trial plan, you will be able to create only one project. You will see an error message asking to upgrade your subscription to be able to add more projects. Navigate to Settings. In the Project General Settings section, click the Delete Project button. Enter the sub-domain name of the project in the space provided. 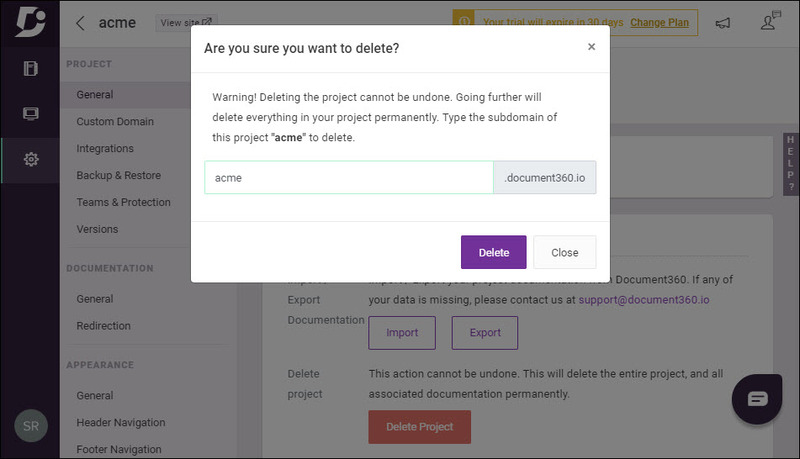 Only upon successful validation, you will be able to click the Delete button to delete the project. Once the project is deleted, you can create a new project based on your requirement. If you need to create another new project with same settings and configuration of an existing project then you can clone the desire project. Cloning the project will take copy of source project and create one seperate project.